A good, basic, no-frills bridge camera which offers a huge zoom range and full manual control. 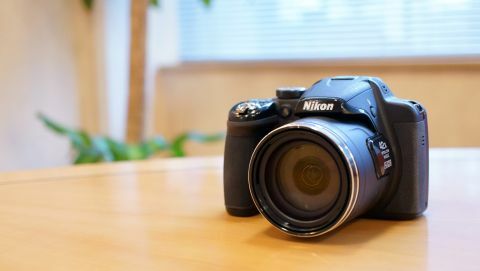 Bridge cameras such as Nikon's P530 get lumped in with the compact camera category, which can seem a little odd when you consider their overall body size. Offering a huge zoom range, and generally full manual control, one of the reasons bridge cameras find themselves in this category is down to their small sensor size. The P530's 16 million-pixel CMOS sensor is just 1/2.3 inches in size, making it much smaller than a DSLR's. It's also a reduction in resolution from the P520, which featured an 18 million-pixel device. It seems that Nikon has simplified the P530 when comparing it with its natural predecessor, the P520, making this a more budget offering. For those looking to spend a little more money, the P600 now exists, with a huge 60x optical zoom. While the P530 features the same 0.2 inch, 201,000 dot electronic viewfinder as the P520, the screen is now fixed, remaining at 921,000 dots, but losing the full articulation of its predecessor's screen. What has also stayed the same is the 42x optical zoom, which gives an equivalent of 24-1000mm in 35mm terms, making it useful for a wide variety of subjects. Enthusiast photographers will be drawn to the fact that the P530 allows you full manual control over different settings. Unfortunately however, it's not capable of shooting in raw format. Along with manual and semi-automatic modes, there is also fully-automatic mode, and a range of scene and creative modes. There's still no integrated Wi-Fi connectivity for the P530, while Nikon has taken the interesting decision to remove the GPS functionality too. A lot of bridge cameras have very long zoom ranges now, making the 42x optical offering slightly less impressive than it once would have been. That said, this camera goes head to head with the likes of the Canon SX50 HS, which although offering a 50x optical zoom, has a similar price to the P530. The P530 is a reasonably chunky camera, and although it's certainly not the largest bridge camera on the market, it's approaching entry-level DSLR size, while it's also pretty weighty, giving it an air of quality. With a rubberised coating, the deep grip of the camera makes it feel especially secure in the hand, while a contour at the top of the camera helps your finger fit snugly. Despite its relatively large size, this is a camera we would feel comfortable using one-handed. On the top of the camera is a mode dial for quickly switching between the different exposure options the camera offers. This includes manual, semi-automatic and fully-automatic modes. There's also scene auto selector mode, a couple of scene modes and the effects mode. Movie mode can be accessed no matter what stills shooting mode you're in, simply by pressing a dedicated movie record button on the back of the camera. Also on top of the camera is a small function (Fn) button which can be set to a number of different options, including white balance, metering or sensitivity (ISO). This is useful if you're often changing the same setting and don't want to dive into the main menu every time. On the back of the camera is a pretty standard compact camera style button layout. There's a scrolling dial that doubles up as a four-way navigational pad, with each directional key having a specific function. Left accesses the timer function, up accesses the flash function, right accesses exposure compensation and down accesses the different focusing modes. To change the autofocus point, you need to press the central OK button and then use the directional keys, or scroll with the dial, to the point you need. It's a reasonably quick process, but you've always got the option to leave the point in the centre and focus and recompose if you're in a particular rush. Zooming the 42x optical zoom lens is achieved via a lever around the shutter release button on the top of the camera. Unlike with the P520, there's no switch on the lens barrel itself. Zooming in and out is pretty smooth and fluid, while it's handy that zooming briefly pauses before straying into digital zoom territory. If you've used a Nikon camera before, then you'll be at home with the main menu system, which for the most part is pretty sensibly arranged. Unfortunately the electronic viewfinder doesn't have an eye-sensor, so you'll need to a press a button next to it every time you want to use it, and every time you want to stop using it. It doesn't make for the most seamless of transitions, and I often found myself not bothering to use it at all because it was too frustrating. If you do use the viewfinder, you'll find that it's not too bad for a bridge camera EVF. It's the same size as its predecessors, and although not as large or bright as some of the current crop from compact system cameras, it's not too bad to use, and useful to have if you prefer using them to using a screen.